As he kneels before Pope Francis at the Vatican on June 29, Archbishop Joseph W. Tobin will receive one of the most special, humbling and uplifting symbols of the Church. The pope will place a pallium—a circular band made from lamb’s wool—around the shoulders of Archbishop Tobin, who was installed as the leader of the Archdiocese of Indianapolis on Dec. 3, 2012. For Archbishop Tobin, the pallium will symbolize his role as the shepherd of the Church in central and southern Indiana, the leader who is entrusted to care for his people including, and especially, those who have slipped away or become lost. The placement of the pallium on Archbishop Tobin will also mark one of the intriguing, ancient traditions of the Church—a tradition that involves two lambs, Trappist monks, religious sisters, an early Christian martyr and the burial place of St. Peter. To describe that tradition, one good way to start is with the creatures who literally give a part of themselves to create the pallium—the lambs. The path of the pallium process begins every year with the arrival of two lambs that are brought to Rome to be blessed by the pope, according to reports from the Catholic News Service. The papal blessing of the two lambs takes place on January 21, the feast day of St. Agnes, a Christian martyr from the fourth century whose name is rooted in the Latin word, agnus, for lamb. “Raised by Trappist monks on the outskirts of Rome, the lambs spent the night before the papal audience in the center of Rome on the rooftop terrace of the Sisters of the Holy Family of the Nazareth,” noted a 2011 Catholic News Service article describing the annual tradition. In the article, Holy Family Sister Hanna Pomnianowska explained that on the morning of Jan. 21, a red blanket is placed on one of the lambs to represent St. Agnes’ martyrdom and a white blanket is placed on the other lamb to recall her virginity. 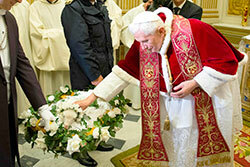 This year, Pope Emeritus Benedict XVI blessed the two lambs at the Vatican in the Chapel of Pope Urban VIII. But the journey of the lambs wasn’t finished. Following the papal blessing, the lambs are “cared for by the Benedictine nuns of Santa Cecilia in Trastevere,” according to Sister of Mercy Mary Ann Walsh, director of media relations for the U.S. Conference of Catholic Bishops. “The nuns care for them until Holy Thursday when the lambs are sheared,” Sister Mary Ann wrote in a blog post about the lambs. The pallia for the new archbishops are then made from the wool of the two lambs. Before the archbishops receive them, the pallia are taken to a historic and symbolic place. When Pope Francis places a pallium on Archbishop Tobin on June 29, the moment will connect them to a tradition in the Church that dates back to the fourth century—the same century that St. Agnes became a martyr for her faith. Just as significantly, the moment will unite Pope Francis and Archbishop Tobin in a new and special way. The extent of that union is explained by Archbishop William E. Lori of Baltimore, who received his pallium from Pope Emeritus Benedict in 2012. “In the ninth century, it became customary for the pope to confer the pallium on metropolitan archbishops, that is, archbishops who are not only charged to watch over and care for their own archdioceses but who also have some responsibility for neighboring dioceses, grouped together in what is known as an ecclesiastical province,” wrote Archbishop Lori on the website, www.catholicreview.org. Archbishop Tobin has that role of metropolitan archbishop with the other four dioceses in Indiana. “From this very brief reference to the history of the pallium, we begin to see its meaning,” noted Archbishop Lori, who is a native of New Albany, Ind. “It has to do with the relationship between the Holy Father and metropolitan archbishops. In fact, it indicates a bond of unity or communion between the Holy Father and metropolitan archbishops around the world. It speaks of a unity of faith, worship and pastoral care for God’s flock scattered around the world. Archbishop Tobin will receive his pallium three months after Pope Francis received his pallium—during his installation Mass on March 19. Yet there is a difference between the pallium that popes receive and the ones that archbishops receive. “The pallium the pope wears is decorated with six red crosses symbolizing the wounds inflicted on Christ during the Passion, Father Lombardi said. He said the crosses on palliums for metropolitan archbishops are black to make clear the diversity of jurisdiction. The history of the pallium will continue on June 29, connecting St. Agnes, lambs, Trappist monks, religious sisters, popes, St. Peter, St. Paul, Archbishop Tobin and all the faithful of the Church—a bond that all leads back to the life of Christ, the Good Shepherd. “Does not his priesthood consist of being the Good Shepherd who became the Lamb of Sacrifice, indeed, ‘the Lamb of God who takes away the sins of the world?’ ” Archbishop Lori noted.